Congratulations to our Bull Mountain Racers! 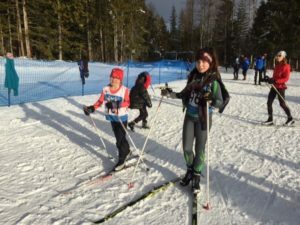 Five of our youth Bull Mountain Racers and one coach competed at the Teck BC Cup#2 in Revelstoke last weekend, January 26-27. 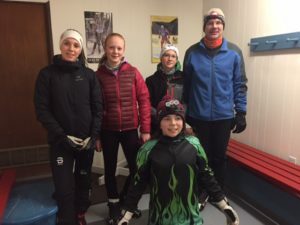 Members of the Bull Mountain Racers team who raced at this provincial competition were Jessabelle Trelenberg, Nadia Wallin, Jake Sutton, Anika Wallin, and Grace Turner. These five racers had 7 top 10 finishes! Anika Wallin earned a gold in her classic sprint (350 m) and bronze in her freestyle (skate) race (3.75 km), and Nadia Wallin earned a gold in her freestyle (skate) race (2.75 km). Coach and Jackrabbits Coordinator, Rob Sutton also competed, in the 10 km freestyle (skate) Masters category. Congratulations to all the racers! They all did really well with a technically challenging course – lots of steep hills and sharp turns. Thank you for a great Wellness Day!